Carillo was a one day event for developers of information literacy teaching and learning material organised by the University of Birmingham Library. It featured a range of talks on the issues around creating, finding, sharing and re-purposing learning resources in the area of Information Literacy. Rebecca spoke about how they had demand from academic departments to develop materials about the pros and cons of Wikipedia, something we need to tackle explicitly the next time we redevelop the Judge section of the Virtual Training Suite. Katy made great use of her image archive on Flickr and one point she made was how we shouldn’t be “information knowledge motorbikes” flying through the air waving at new students about information literacy, but need to get beyond first years to staff, researchers and others. Tom also made a broader point that feedback in learning objects needs to be rich – more than just right or wrong – as these interactive points are often where students are paying the most attention and where learning can occur. As someone who has catalogued many resources for JorumOpen, it was interesting to see the other delegates try it out during the hands-on session in the afternoon. They wanted to get to the resources themselves and were often frustrated when a Jorum record was only a web link – similar to the frustrations users may feel when using databases or repositories that only provide the metadata of a resource, rather than the full text. The NDLR aims to “support greater collaboration in developing and sharing of digital teaching resources and associated teaching experience across all subject disciplines and communities of academics”. They do so via a a repository of resources, providing a space for academic Communities of Practice to grow and by funding development projects. The afternoon featured hands-on workshops and the session on repurposing learning objects brought together some issues from all of the talks. A key selling point for learning objects and Open Educational Resources generally is their supposed re-usability, saving people from reinventing the wheel. However, the practicalities of reusing learning objects can sometimes be insurmountable. Licensing restrictions, proprietary file formats (Flash), making items generic without dumbing down or having to insert / remove branding – all these things can get in the way. So some important questions remain. If a learning object is perceived as being useful, then perhaps it is more important that it is easy to customise or personalise, than to change its purpose? Is it enough to be inspired by a good quality learning object, to produce something yourself or to link to a good example from elsewhere? Where does re-purposing stop and recreation start? Is changing the content and structure of a learning object a bit like replacing the brush and handle on a broom? An excellent and thought provoking day – many thanks to all at the University of Birmingham Library for organising it and hopefully there will be a CaRILLO 2 in the not too distant future. I should start with introductions – I work on the Virtual Training Suite, a set of free Internet tutorials to help student develop Internet research skills for their university course, but this is not a typical week – it’s the last week that I work for Intute, the database of academic website – I’ve been with Intute (nee SOSIG) for the last 5 years specialising in the Social Sciences (Economics and Education) and learning technologies. The day starts abruptly at 8 AM with a loud and unwelcome alarm – ah, the joys of rampant insomnia. My day will be full of inputs, media, screens and other stuff screaming for my attention, so I deliberately begin the day quietly – no TV, radio, e-mail checking, just a silly comedy podcast like The Now Show or Answer Me This to accompany me on the short walk to work, and put me in a good mood. The communications catch-up from the weekend usually takes longer, but it appears that it has been fairly quiet since Friday, so I can concentrate on my “Informational Nerve Centre” or Google Reader to normal people. 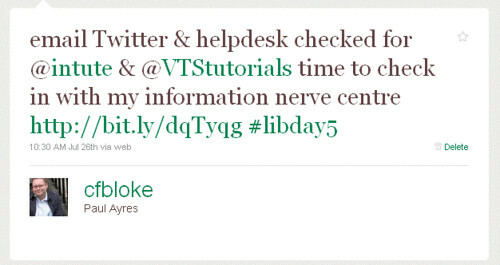 I track mentions of Intute and the Virtual Training Suite across the web, repost some items to the VTStutorials Twitter channel and keep a few things unread to return to later. Next week I’m off to an event on Creating and Re-using Information Literacy Learning Objects (CaRILLO) which looks very interesting. One of the things we will be looking at in the coming year, is making the Virtual Training Suite more relevant to the Information Literacy community, so this is a great opportunity to learn more about their needs and what they are doing already. Time for lunch before an afternoon of meetings, but not before a wondrous distraction in the form of Jane Austen’s Fight Club – very silly indeed! The afternoon is dominated by our last ever Intute: Social Sciences meeting – an audio hook-up with our colleagues at the University of Birmingham who we have worked with over the last few years. There’s little actual business to discuss, just a few odds and ends, as we hand over the Internet Resource Catalogue to the gang at Mimas, who will be maintaining it during the final year of Intute. Much more importantly we get the chance to pool our knowledge about what our colleagues at the seven Universities that made up the Intute consortium are getting up to in the future – it seems as though most have found lifeboats of one form or another, which is a relief to know. The afternoon ends a little earlier than normal, as our boss takes us out to the Hope and Anchor, an idyllic pub with a great beer garden to mark the passing of Intute: Social Sciences (nee SOSIG). We are joined by a few “friends and family” who have worked on the service over the years, including the original project director who got the grant for the pilot service back in 1993! It’s a nice send-off to mark the end of an era – more of a fond farewell, than a wake. 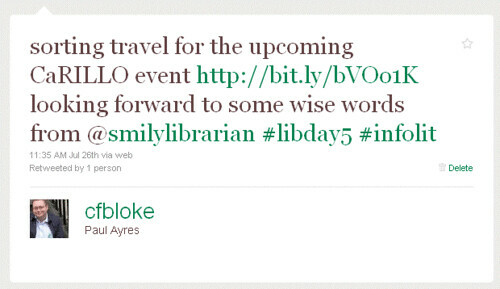 As for this librarydayinthelife stuff – I think it will have to be edited highlights for the rest of the week! Thanks to @KarenBlakeman for this – her presentations are much better! It helps when your blog theme is wide enough to cope! Loyal readers may well have spotted that Intute has been experimenting with Twitter for a while, now we are going to be Twittering on behalf of the service as a whole. Up to now we have been providing a range of subject based updates and some of these seem to have been quite successful – for example the Intute: Economics, Intute: Visual Art and Intute: Psychology channels. Some analysis of the first 500 followers for our economics channel shows that some of our users are already on Twitter, talking about Intute and kindly spreading the word about some of things we are up to. In the past, I’ve written about different ways of using Twitter – passive Twittering – sending existing content to Twitter via a service like Twitterfeed – and active Twittering – where a real person provides updates and tries to become a guide on a topic or to a particular service. A few weeks ago, the Intute channel on Twitter was set up as a passive feed of existing Intute activities, now we are going to take on a more active role and as an experiment for the next few months, we’ll be actively Twittering during what will be a very busy time for Intute (but more of that later). … if it is good enough for organisations such as Copac, the British Library and even the FBI, then it’s about time that we played our part. So now we are actively joining the conversation, what should we be Tweeting about? 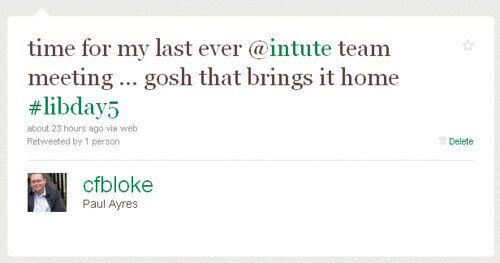 … or anything else that may be of interest to Intute users – but hopefully you will be using Twitter to send us new websites to add to Intute, let us know if you want to know more about how we work and what we do or just to stop by and say hello. So if you don’t want to get in touch via our email Help Desk, let us know your thoughts via our rolling feedback survey or even by leaving a comment on one of our blogs, you can now follow Intute on Twitter. Which is a better summary of the content? The Bible is the central religious text of Judaism and Christianity. The Jewish Bible comprises: the Torah, the Prophets, and the Writings. The Christian Bible consists of the Hebrew scriptures or Old Testament, and later writings known as the New Testament which includes the life and teachings of Jesus Christ. Recently the issue of digital identities has been invading my consciousness – not so much what do we mean by an online friend, but how do we acquire or stumble into different groups of people online – so I thought that I’d do an inventory of the various Web 2.0 sites and the groups that have coalesced round me. Facebook – possibly my least favourite Web 2.0 app – I can’t say that I have ever had a period when I was really into it – the creeping agglomeration of personal information about me and the very closed walls somehow discourage me from doing any social networking there – however the reality is that it is the big beast on the block, the friends are all people that I know and there are people there, who I’m not in contact with any other way. Twitter – possibly my favourite Web 2.0 app – it has disarmed me into sending message to complete strangers – or at least those that choose to follow me first – even the term – follower – is light-touch and non-threatening – in the beginning I weeded out people I did not know, whereas now only an easy to spot spammer or marketeer will get blocked – I only know 20% of my followers in real life, but I’ve interacted online with a much higher proportion of them thanks to Twitter. Delicious – there was quite a long time when I did not even realise that there were networking features on Delicious! But I eventually discovered my network and the fact that I had fans! A lovely phrase and a complement in that these people seem to think that what I’m bookmarking is worth watching – while I know about half my network there, the fact that strangers like what I come across, makes me feel good. Flickr – there’s a real point to Flickr – I’ve just collected people if I like their photos, and some of them have reciprocated, though many were already known to me and the social side of just wanting to keep up with what people are doing – in photo form – is what has pulled me in – not very far, but the pictures give you an instant hit and a clearer idea of what people are doing. So what do all these different groups mean? There’s nowhere the groups match exactly, so there are different people for different sites – despite the recent attempts to start bringing these groups together – with one Web 2.0 service talking to another – that should come as no surprise, we go down a pub with a different group of people we might go out to the cinema with or out clubbing or even social bookmarking. Ideally a Web 2.0 site with social networking facility should have the low bar and friendliness of interaction of Twitter, the actual sense of doing something you get with Flickr, the surprise of fan-dom of Delicious and the comprehensive pool of people of Facebook – too much to ask? Probably! Only two of them don’t have bio pics – and what a fine looking lot you are too!